Hunterdon County Chamber of Commerce is a vital organization. Its committee activity, programs and involvement in county-wide business promotion speak for itself. On these web pages you will have an opportunity to view and sign up for activities and programs that benefit your company. You will find links to other important organizations and services throughout the county. You can read the newsletters the Chamber publishes and decide if you'd like to be on the subscription list. And finally, there's often fun to be had at one of our Card Clubs or other more social happenings in which you might want to participate. ​ Stay informed! 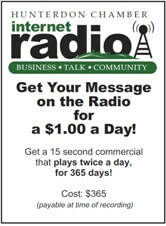 Click to Listen to Hunterdon Chamber Internet Radio!